IT'S 32C in Miles, Queensland, and everyone on the bus is in desperate need of a swim. "There's a pool," said Ken Brown, gesturing out the window. He's not joking: In front of the skeleton of a house he's driving past, there is a ladder and a rim of coping tiles. 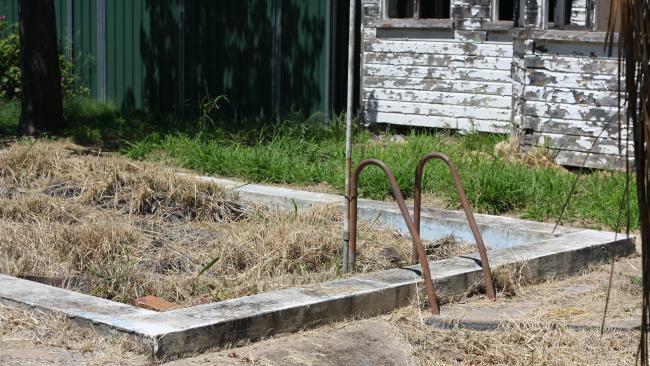 But the pool is filled with dirt and scattered with weeds. Born and raised in the Western Downs, Mr Brown is a full-time bus driver. 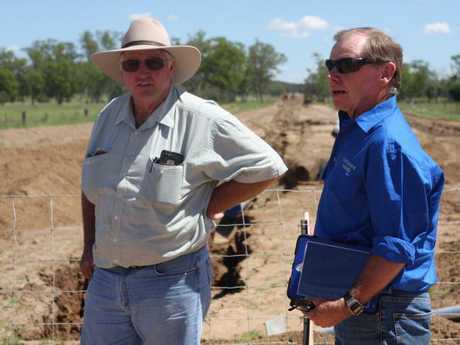 Today, he's showing a group of farmers around his hometown, Miles, 330km northwest of Brisbane. Unlike Mr Brown, these farmers are not from Queensland. They live on properties in New South Wales and South Australia that may soon be impacted by coal seam or shale gas infrastructure. Many are on the high pressure pipeline route from Santos' controversial proposed Narrabri Gas Project. 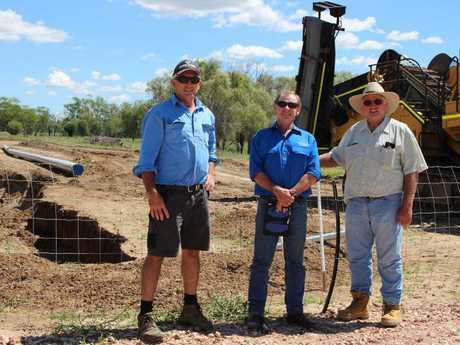 Awaiting the approval of such projects, the farmers are embarking on a four-day tour of southwest Queensland for a first-hand look at its gas infrastructure and the social consequences of boom-bust mining economies. 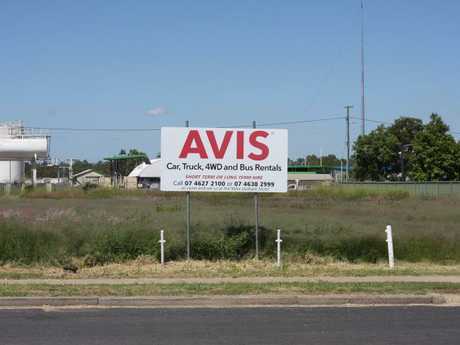 Though it's not a mining town, Miles was part of southwest Queensland's coal seam gas construction boom. The explosion in exploration and mining activity in its surrounding areas saw a huge influx in workforce demand and fly-in-fly-out workers from around 2010. "GISERA (The CSIRO's Gas Industry Social & Environmental Research Alliance) put out these fantastic figures," said David Sweetapple. He's a real estate agent and land developer in Miles, and has lived in the region for 60 years. "They said they would need accommodation and infrastructure built, and feeding and entertaining. They said we will live locally and buy locally. So the town went wild. The banks lent us all money - the council spent $30 million in Miles alone on water sewerage and waste management," Mr Sweetapple said, referring to the time around 2008 when the initial presentation from APLNG (Australia Pacific LNG, Origin Energy's joint venture with ConocoPhillips and Sinopec) was made. Existing homeowners with a patch of backyard to spare subdivided their blocks into two, and towers of flats began to loom over old Queenslanders. Developers and investors flooded in from all over Australia, and there was a surge in new housing with 1500 new homes approved. "It was like being caught in a gold rush," said local Rachel Kerwick. She's president of the Miles & Districts Chamber of Commerce, a role she has shared since its inception in 2005 with fellow community member John Hoffman. "There were investors from Melbourne and Sydney, well-educated people who did their homework and believed the literature the government and the CSIRO all put out," Ms Kerwick said. That literature included an environmental impact statement, a future directions statement, and a social impact management plan, a detailed document that outlines how APLNG would mitigate the social impacts that arise from their work in the Western Downs region. Miles's population was projected to increase to 5000 people, and a growth in the workforce was predicted to continue until 2034. "They were talking about the town of Miles and Chinchilla actually merging," said Mr Sweetapple. For locals leasing housing, the immediate effect of the boom was a rent increase. Mr Brown set a scene as the bus winds through a half-finished estate behind the racecourse. "Imagine you've got a son who finishes school and wants to stay around. He gets a job at the local council, where he can make a weekly salary of $700, and he doesn't bother buying, because he can rent for $300 a week. His wife works at the tuckshop; the kids are in the swimming club. Then the miners move in, and the agent knocks on his door and says, 'Sorry mate, but we can get $800 for this place now.' So your son and his family leave town." According to Mr Sweetapple, one look at property and housing prices during the boom will show that Mr Brown's scenario is not hard to picture. "You'd buy a block for $200,000," Mr Sweetapple explained, "and spend $450,000 on a really nice house; put in Colorbond fencing and paving. The rent at the time was $800 to $1000 a week." At the peak of the boom, even a space at one of the local caravan parks crept up to nearly $1000 per week. Long-term residents who could no longer afford the rent moved out. But when the construction phase of all major coal seam gas projects progressed to the export phase, many mining contractors and employees were laid off. And once the Condabri workers camp that many of them were living in was emptied, the overflow of those renting in Miles were shifted to fill the camp's 400 beds. "Origin walked into our real estate office one day at the end of 2013 and said, 'We're cancelling every lease of the houses we have. If anyone wants a job, they have to live in the camp,'" said Mr Sweetapple. "Virtually overnight, in December 2013, the town just drained out of people and they never came back." As per APLNG's social impact management plan, construction workers are often accommodated in temporary facilities like Condabri to help ensure that community demographics in regional towns are not negatively impacted from an influx of new residents. But given that more than 100 workers were initially housed in Miles to begin with, their absence was felt immediately. "We had hundreds living in a camp less than 25km from our town for years," Ms Kerwick said, "and they never even came in. They might have driven through the community on their way to work, and occasionally, if we were doing a community event like the races, they'd send a busload of people in, but that was it." Mr Sweetapple too is frustrated about the mining companies' failure to engage with the town in the way they promised in the APLNG documents published in 2010 and 2011. "Having told us they were going to live local and buy local, they then said, 'Local for us is camps out of town. We're living in the area.' As for buy local, they said, 'We're a multinational company. We're APLNG and local for us is Australia and New Zealand, not Miles and Chinchilla." For its part, an Origin spokesman told news.com.au: "Origin, as Upstream Operator of Australia Pacific LNG, is proud to have committed tens of millions of dollars to support local communities such as Miles, and remains committed to the region by continuing to provide incentives for our staff to live locally and by sourcing local goods and services through our 'Regional Buy' program." He added Origin has spent millions of dollars to benefit the local community, including investing $2,000,000 into a community skills scholarship, providing up to $13,500 to apprentices within the gas fields region to help them complete their apprenticeships locally. Since 2007, more than 150 scholarships have been awarded. Origin has also invested in housing, plus water and sewage upgrades in the region, and upgraded the local airport to the tune of $20 million among other projects. According to Mr Brown, the only people who will benefit from a boom are publicans, local councillors, real estate agents and investors. "The local drapery store won't, [the mining workers] won't buy shirts from there. They're nomadic. They move around all the time and follow the work. And if someone does bring his family, do you think his wife is going to work in the school tuckshop?" After the last of the mining workers were shifted out to Condabri, the vacancy rate in Miles rose to 45 per cent, where it stayed at for several years. 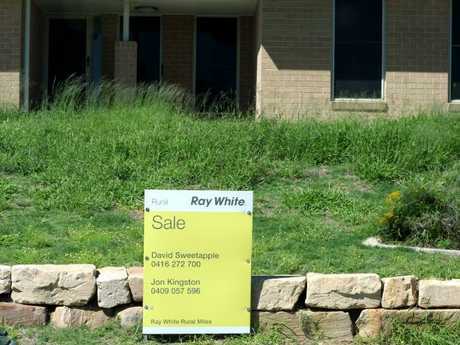 "Rents were down to $150 a week for those fortunate to have it," Mr Sweetapple said. "That was furnished apartments, furnished houses." According to Ms Kerwick, some people just walked out, and those who stayed all suffered financially. "We're left with people whose businesses went bankrupt and who lost their homes because they took the punt and invested in building another one. Mortgages and repossessions are happening at least once a week," she said. The incomplete estate behind the racecourse Mr Brown drives through is owned by Mr Sweetapple. It still has four stages of completion to go, but construction has halted. "In my estate, there have been three of four mortgage and repossession sales, and they've sold for $20,000 to $22,000 a block," the real estate agent said. Today, Miles' population stands at just 1800, a number that now has to front the cost for the $30 million worth of infrastructure they no longer actually need. Mr Sweetapple said the rates on the properties he owns in town have doubled in the last four years. "We have even less people than we did before [the boom]," said Ms Kerwick. "The Miles community itself was almost decimated. Brand new homes that cost the investor $700,000 to build are being sold for $200,000." Mr Brown tells a story about his neighbour, a woman from interstate who bought the house next door to his for $400,000. "She subdivided the block and developed it, then just sold them both: one for $200,000 and the other for $160,000," he said. According to Mr Sweetapple, the aftermath of the mining boom completely killed the market. "The rents plummeted, the property values plummeted and they kept the camp full. That's when I read very carefully through all the Origin lease documents and the approvals granted by the Coordinator-General," he said. In 2016, Mr Sweetapple discovered a condition in Origin's 2010 Environmental Impact Statement that said under no circumstances can a temporary workers accommodation facility exist beyond five years. "They were in breach already. [The Miles & Districts Chamber of Commerce] got more and more politically active, and we met with [Origin's] CEO eight times. He basically said that if you make it difficult for us, we'll make it doubly difficult for you." Then in May 2017, after months of negotiations, the multinational corporation announced that it would close its Condabri workers camp for good later that year. 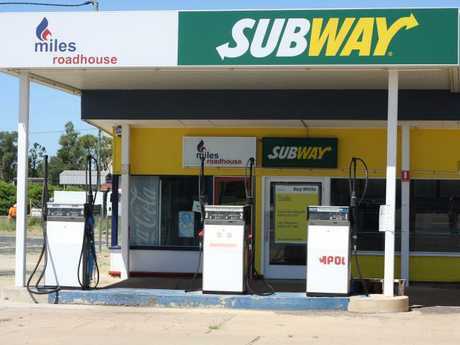 Origin's remaining operations staff would have to move into local accommodation arrangements in Miles, as well as in neighbouring towns such as Chinchilla. "Had we not as a community fought that very hard, they'd still be in that camp," said Mr Sweetapple. 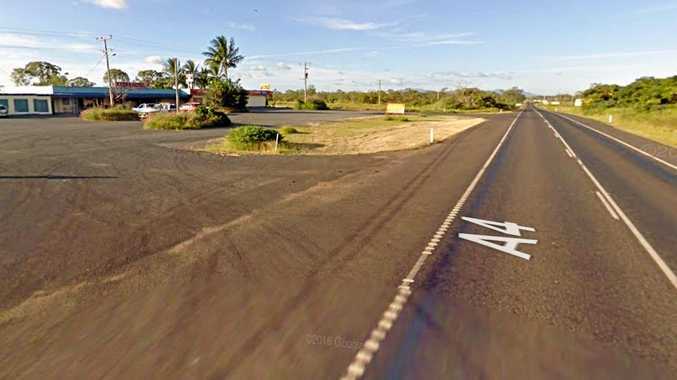 In August last year, the Queensland government legislated against workforces on large resource projects within 125km of regional communities being 100 per cent fly-in-fly-out workers. According to the government's social impact statement, the Strong and Sustainable Resource Communities Act was introduced to "ensure that residents of communities in the vicinity of large resource projects benefit from their construction and operation". "Straight away you could see the difference," said Ms Kerwick. "They can still build a camp, but it has to be within the town. In Chinchilla, the camp is in the fringes of the community, so the people can go to the town gym, use the town pool, go to the pub a couple of nights a week if they don't want to have tea at the camp." "It's a massive positive," said Mr Sweetapple, "but it hasn't come without its own problems." While in the camp, a worker's living expenses are completely covered. "You're flown in and out, you're given whatever you want to eat or drink. Your electricity, your cleaning, your internet is all covered. You want for nothing." But now that workers in the Miles region are no longer allowed to reside in a camp away from town, living away from home allowances have been slashed. "It's already hard - they're away from their families trying to make a living, and suddenly they've got to come up with this extra money to compensate for what they had in the camp." When Mr Brown is asked who is left in Miles, and what he thinks of the town's future, he is largely optimistic, though complains about the lack of social services in place to support many of the low-income earners who have moved in to take advantage of the cheap rent. "There's a good vibe mostly," he said. "There are just too many empty houses. Who is going to live in them? There's no work." 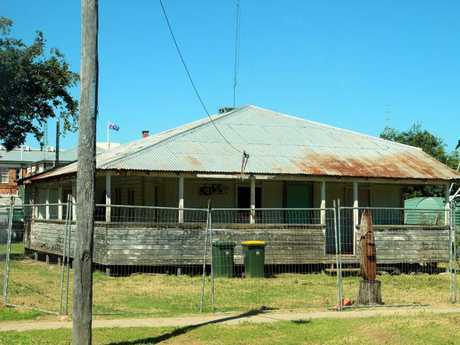 The town is more than half an hour drive from Chinchilla, and with little work in town, many locals have abandoned Miles. But Mr Sweetapple said new projects are on the horizon. "Miles is in the Goldilocks zone - we're very close to the power grid and we get the most sunlight. All those substations are in place to receive some of the renewable energy that's being produced by the solar farms," he said. "You've got massive upgrades to the power infrastructure to receive all this solar energy. The rail line has to be built from Miles to Banana, Nathan Dam has to be constructed and a big pipeline is needed to droughtproof the town." "There is a bit of optimism around again - not enough for spectators, but enough." As for the gas industry? "Origin has offered [its workers] a very generous incentive," Mr Sweetapple said. "The average guy will get about $35,000 extra a year if he buys locally. But no one is doing it because they don't know week to week if they'll have a job. There's been a big restructuring - Origin is trying to wind back its costs, so they've laid off hundreds of staff. The last thing any workers want to do then is buy a house in Miles and get caught with it. "Unless [the workers] are forced to pay for their flights in and out or the government intervenes, I don't think there'll be any change. [The coal seam gas industry] has been a complete and utter disaster for the town." Mr Sweetapple said he recently received a survey from a company contracted by Santos to assess its community impacts. In 2007, Santos created the GLNG project, which converts natural gas from the Surat and Bowen Basins into LNG for export to Asia. "It said, 'Santos has donated $630,000 to the region. Do you agree, disagree or strongly disagree?' If they'd said, 'Santos has spent $630,000 - can you see where it's gone?' or, 'What impact has this company had on your community?' it would have been good, but there was nothing like that." Tony van Lubeck and Tony Smith inspecting a property outside Miles while researching what can happen to a former boom town. Instead, Mr Sweetapple made his own survey, and circulated it among 100 people in Miles. Using a company statement that discussed the mitigation of impact on communities, he apportioned the exact wording of the text with a line down the middle. "I asked '1 out 10, how well did this company do in Miles?' The highest score they got was a 4. I sent that to the Coordinator-General. He said, 'Oh no, that's not an official survey.'" According to the APLNG's community investment action plan, the multinational corporation is dedicated to funding social infrastructure, as well as sponsoring and donating to local organisations' projects or events. They also aim to foster dialogue with communities, which is a commitment Mr Sweetapple said Origin's regional manager, Tim Ogilvie, has fulfilled. "Tim has been very understanding of [Miles'] cause … he attends Chamber meetings and has met with us regularly. It's directives from senior executives that have caused so much financial and emotional hardship." Ms Kerwick said big players like Origin have failed to adequately assist the community. "They splashed their money and gave some clubs laptops, but they never built any sustainable projects," she said. "Only now that [The Miles & Districts Chamber of Commerce] has fought for money we can do a few legacy projects, but the whole thing was handled very poorly." "You can see why the community feels like it does," said David. "The gas companies have damaged the very fabric of our town. We were all encouraged to gear up to provide for 40 years of partnership with the resource companies. But they only use tier-1 and tier-2 contractors - they don't use the locals." As the bus tour winds down, Mr Brown returns his passenger to the local museum so they can continue on to Roma. The mood in the car is sombre. "The gas industry's claims are pretty false that there's not much impact," said Tony Smith of Broadwater in Warren, NSW. "It's as much social as it is environmental. If you look at the town of Tara, it didn't seem to gain. The destruction of Miles is terrible. 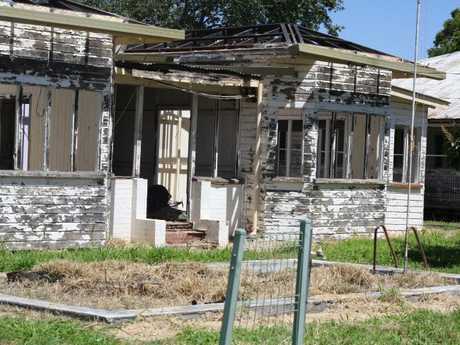 Greed got in the way, and now there are all those empty houses." Ms Sweetapple said that farmers like Mr Smith, who will be directly impacted by the proposed 450km pipeline that will link the Moomba Sydney Pipeline to the planned Narrabri Gas Project, should think very carefully before signing anything. "What's happened in the town is the most devastating thing," he said. "If any community was considering it, I'd seriously say don't do it. Don't get involved. Don't believe a word they say. Don't believe anything Treasury says. It's all a gross misrepresentation." News.com.au has contacted representatives from APLNG, Origin Energy and ConocoPhillips, and are awaiting comment from an authorised media contact.